With this option, I take a brand-new high-quality T-shirt and draw onto it, by hand, the image that you select, and then send you a one-of-a-kind garment in return. Take a look through my four Galleries (links at the bottom of this page, and from the homepage: Figures, Commedia dell'Arte, The Kitchen Sink, and Klee Angels). In less than 2 weeks from the time you place your order, your unique T-shirt will arrive via the USPS. With this one we get a little crazy! 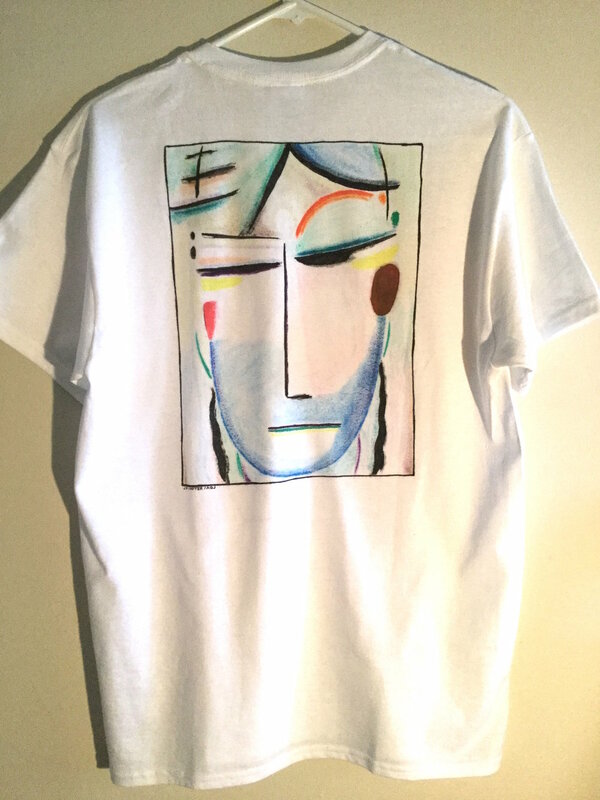 Would you like to have a shirt you already own get one of my drawings added to it? Then send it my way! Contact me using the CONTACT page, to let me know you want to send me your shirt. I'll reply with my address, and you send it to me. From there, it's as simple as letting me know which image you want me to draw onto your shirt, and when I'm done, I'll send it back to you! It's the ultimate in personal, original, wearable art. This is my friend Laura. She gave me her shirt, and I made it into something original! Is there an image you'd love to wear, but don't see in my Galleries? Or maybe you'd like me to add color to one of the black-and-white images I do offer? Or perhaps you'd like me to make you a completely original image? Let me know! I'd love to work with you to make something completely unlike anything else out there. As with Options #1 and #2, head over to the CONTACT page, and email me to start the conversation. Each individual shirt is a unique creative expression, and filled with my love, craft, and delight. The simplest designs take around two hours to complete from top to bottom; more complex ones (like the image above) can take between 5 and 10 hours to complete. Option #1 (Brand-New T-shirt): One-Color Ink (Black, White, or one color of ink): $40.00 (USD), shipping and handling included //Multi-Color: $55.00 (USD), shipping and handling included. Option #2 (Your T-Shirt): One-Color ink (Black, White, or one color of ink): $30.00 // Multi-Color: $45.00 (USD), shipping included // (USD), return shipping also included. Option #3 (Customized T-Shirt): Pricing is worked out on a case-by-case basis. (Based on image size/complexity/coloring/originality (my art, or someone else's), etc., and whether it's a brand-new tee, or your own.) Free free to CONTACT me with your questions and ideas! Besides guaranteeing that your t-shirt will be the only one like it in the world (and that my art on it is also original), I also work with strong and high-quality t-shirts, ensuring a long life even for active wearers. Each tee is pre-shrunk and machine washable. The ink I use is specifically for fabric, and will never bleed or wash out into your other clothes. What I love most about working with ink is that it heightens the uniqueness of each garment (I never use mechanical techniques like screen printing or pressing) -- which I'll talk about more in "The 'Why'" tab, if you find yourself clicking on it while you're here. All drawings and art images ©2017 Jon Froehlich. First and third photos by Daniel Levitt. Second photo by Jon Froehlich. All drawings ©2017 Jon Froehlich.